The 30th batch of students to pass Karen National Liberation Army’s (KNLA) Basic Medical Training course graduated at a ceremony held on 10 November in Karen National Union (KNU) Brigade 7 territory. 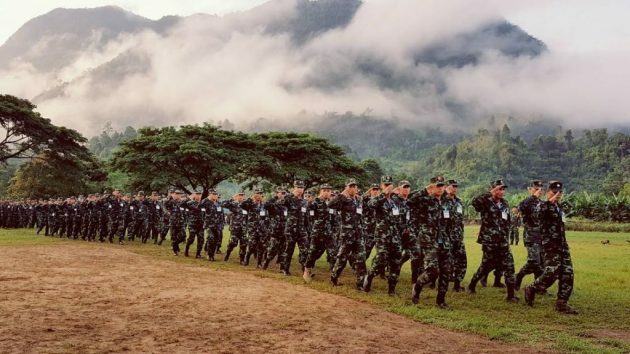 The 105 students, who are all members of ethnic armed organisations (EAOs), came from many ethnic groups including the Karen, Kachin, Arakan, Kayan, Naga and Palaung ethnic groups. The aim of the six-month course is to help improve medical care in ethnic areas and to foster understanding between ethnic people. After graduating the trainees return to their areas and provide medical care to EAO troops, villagers and other civilians. The 30th annual training session, run by the KNLA’s Military Medical Department, ran from 2 May to 10 November 2016. It covered basic military training, basic public healthcare, anatomy, ophthalmology, first aid, obstetrics and surgery. The Back Pack Health Worker Team (BPHWT), and the Burma Humanitarian Mission (BHM) also help to support the training. The first Basic Medical Training Course was held for Karen trainees at the former KNU headquarters at Manerplaw in 1979 and it has been held most years since then. Other ethnic people were allowed to take part in the training from 1996 and over 2,000 people have been trained by the scheme.